Since then, they’ve become one of the best-selling bands of all time, with 10 multi-platinum albums and worldwide sales exceeding 75 million. On May 19, Foreigner will celebrate their 40th anniversary with a new career-spanning compilation, 40, which features 40 hits from 40 years. The band also will embark on an extensive U.S. tour with Cheap Trick and Jason Bonham’s Led Zeppelin Experience. These days, Foreigner is Mick Jones (lead guitar), Kelly Hansen (lead vocals), Jeff Pilson (bass), Tom Gimbel (rhythm guitar/flute/saxophone), Michael Bluestein (keyboards), Bruce Watson (lead guitar) and Chris Frazier (drums). I recently spoke with Jones about the band’s 40th-anniversary plans, his upcoming autobiography, gear and more. This year marks the 40th anniversary of Foreigner. When you look back now—with so much perspective—what thoughts come to mind? It’s a real gift and has basically been two-thirds of my life. It’s been a passion for me and I’ve stuck with it through thick or thin. I’m very grateful for having the opportunity to have an experience like this and to be doing something that I really love. It’s outlasted any expectations. What does the band have planned to celebrate the occasion? It’s the 40th anniversary, so we have the Foreigner 40 album that’s coming May 19. We’ve also got my book coming out, which is my first autobiography where you’ll find out a bit more about me. Then we’ve got a huge American tour where we’re bringing along Cheap Trick and Jason Bonham’s Led Zeppelin Experience. We have a couple of the guys coming out to play with the band, including Rick Wills and Dennis Elliot. There’s also plans for Lou Gramm to come out and do a few shows. We hope to make it a celebration. Kelly Hansen has been with the band on lead vocals for more than a decade. What’s it like having him with the band? Kelly was the reason I felt confident to go ahead with this in the first place. Obviously, those were big shoes to fill, but Kelly is a go-getting front man and performer who carries the songs incredibly well and gives 150 percent every night. But that’s really the thing about the whole band—everyone is totally dedicated to what we’re doing. It’s a rare thing to find something where everyone is on the same page. There’s good feeling all around. Interview with Mick Jones by Clicking Here! Classic rock giants Foreigner may be responsible for some of rock’s most enduring anthems, with an arsenal of hits that include songs like “Cold As Ice” and “Juke Box Hero.” But on May 6th, the band will join forces with another legendary group, Styx to release the ultimate seasonal package— appropriately called “The Soundtrack of Summer”. This new album collection features sixteen classic songs by both Foreigner and Styx as well as a brand new interpretation of one of classic rock’s most successful songs ever, “Hotel California”. Original songwriter and former Eagles guitarist Don Felder teams up with Foreigner and Styx for this very special collaboration as well as for a stunning new version of Foreigner’s massive hit, “I Want To Know What Love Is” (which will only be available as a limited edition vinyl disc and on iTunes). The Soundtrack of Summer album will also coincide with a highly anticipated tour of the same name – featuring Foreigner and Styx with special guest Felder as the opening act! 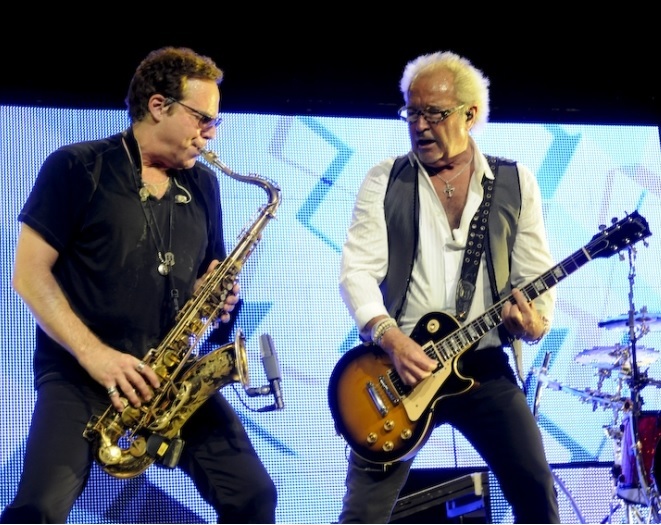 I spoke with Foreigner guitarist and mult-instrumentalist Tom Gimbel about the Soundtrack of Summer, his early years touring with Aerosmith and how he got hooked up with Mick Jones and Foreigner! What started this tour project idea and album? Sometimes, management teams brainstorm about which combination of bands would work best during the summer. This one makes perfect sense – Foreigner, Styx and The Eagles [Don Felder] all go together so well. It’s something we like to call “traditional” rock music. Once we all decided that we were going to tour we thought, why not do a little bit of recording together to have something that would set the tone. Tell me a little about the new version of Hotel California and the recording process. The idea was to have each band involved on the song give their own little segment and then have everyone harmonize together. It’s all one big musical family. We were able to recreate so much by using a lot of the modern techniques of recording. Not having to wait for the tape to rewind was a really cool advantage! [laughs]. What are some of your own best summer memories? When I was growing up I was a big fan of The Who. I remember listening to Quadrophenia and albums like that and just thinking “Wow! This is the kind of rock music that I want to get involved with!” Hearing it now really take me back to memories of being a kid. It was such a cool era of music. Tell me a little about your days at Berklee College of Music. When I went to Berklee it was primarily a jazz school. So it was a little too late for me to start learning jazz guitar. But I was more than happy to stay a rock guitarist while I was there and instead played the flute and saxophone. One of the things I learned while I was there was that if you wanted to get really good on your instrument, you had to spend a lot of hours practicing. How did you get hooked up with Aerosmith? While I was in Boston going to Berklee I was also performing in bands and hooked up with a guy named John Butcher. We made a few records on Capitol together and a lot of the people we worked with knew the guys in Aerosmith. That’s how I was recommended. It was a completely different world back in those days because someone had to actually give you their phone number. There was no Facebook or Internet back then. Tell me how you got the gig with Foreigner. That was another situation where someone recommended me. Kevin Williamson was a guy who worked at Atlantic Records and he was playing golf with Ricky Phillips, the bassist for Styx. Ricky’s a friend of mine and while the two of them were playing Kevin mentioned that Foreigner had an odd situation. They were in need of a guitar player who also played sax. That’s when Ricky said, “Hey, I know a guy who does that!” and he gave him my number. A few days later, Mick’s brother Kevin called me up and said “Let’s talk about Foreigner”; and I said “Yeah, let’s talk!” [laughs]! Playing guitar and sax was my dream come true. Has there been any thought given on another new Foreigner album? We did an album of all new material back in 2010 called “Can’t Slow Down”. Mick continues to write and is always collaborating with different people. I’m sure at some point there will be some new material. I’m not sure if it will be a whole album though. Maybe a two or three song package. We’ll have to wait and see but there will definitely be some new music. You’ve been with the band for more than twenty years. What’s the experience like? It’s been marvelous every step of the way. It’s a real pleasure to work with every one of these guys. This is one of those bands where everyone really respects and admires each others musicianship. We have monsters on every instrument. Mick sets a great example as our leader. He sets the tone. I look forward to playing with these guys every night. I’ve got some final words to say about this years Grammy Awards. Truth be told, I haven’t had much interest in watching them anymore. Now you would think that as a musician The Grammy Awards would be something always on my agenda of things to watch. To see the best of the best get their due. But sadly, the ceremony, much like the AMA’s, CMA’s and any other “MA’s” I may have missed, seems to have become nothing more than just a lackluster showcase for the music industry to pat itself on the back instead of awarding real talent. Don’t get me wrong, this year Adele easily deserved to sweep everything. She is a true diamond in a sea of the same old same. But outside of her obvious and most deserving win, every year the awards seems to turn more and more into something that can’t be taken seriously. Consider the way Chris Brown was graciously accepted back onto the stage again and won a pair of awards after his most recent shenanigans. Or the way Dave Grohl of The Foo Fighters was blatantly cut off during his acceptance speech when he started telling the truth about how music should come from the heart and not a computer. And lets not forget the fact that a group of “old men” (The Beach Boys) schooled everyone who hit the stage before them with true vocal harmony. But I’d really like to focus the meat of this blog on the list of artists from the “Rock Performance” and “Metal” categories. Because, you know me, it’s all about the Rock and Metal. Look at the variety of artists from three decades ago. All with hit songs and all deserving. Where is that variety today? Please don’t misunderstand me, I love the Foo Fighters. Really, I do. But three different songs winning Grammy awards? And one Grammy for Best “Metal” performance? The Foo Fighters aren’t “Metal”. It really upsets me that there seems to be a lack of true nominees in these categories whether by accident or deliberate intention. Every time you see the list of nominations you pretty much know who is going to win. And why is it that groups you’ve never heard of always seem to get a nod and bands that have Grammy history and new albums get ignored? Consider artists like Journey, Foreigner and Night Ranger for example. Ok, I agree that it’s been years since any of them had songs that topped the charts. But all of these bands have released albums of brand new music, most of it very good and all within the time frame of nomination, but their body of work wasn’t even acknowledged by the academy. Now I’m not saying any of these artists should win. Hardly. All I’m saying is that wouldn’t it be nice to at least recognize the efforts of bands that have stood the test of time and continue to deliver music for their fans? But instead, true musicianship gets over shadowed by the need for computer generated beats and auto-tuned vocal performances. I guess I shouldn’t really be surprised though. I mean lets face it, this is the same awards show that gave the very first Grammy in the Hard Rock/Metal category to Jethro Tull instead of Metallica. And don’t get me started on that whole Milli Vanilli incident.